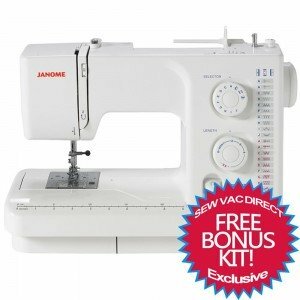 If you’re looking for a simple sewing machine, the Janome Magnolia 7318 may be the right choice for you. With a nice number of stitches and manual operation, the 7318 may not come with all of the bells and whistles you see on high-end machines, but it sews like a dream. I’ve had the pleasure of testing this machine, and I’m going to share my experience with you in this review. Is this the best simple sewing machine? Let’s find out. As you can see from the features listed above, the Janome Magnolia really is a simple sewing machine, but that’s really what makes this model so appealing. I was really unsure about how I would feel about this machine, but it truly did make sewing simple, easy and enjoyable. Whether you’re a true beginner or an experienced seamstress, you’ll have no issues using this machine. The first thing I want to touch on is the fact that the Janome Magnolia 7318 sewing machine is a mechanical machine. A lot of the sewing machines on the market today are computerized, which can be convenient, but can also come with a lot of drawbacks. If you run into any technical issues, the machine may become useless because the cost for repair can be very expensive. With a mechanical machine, there are fewer components to worry about. Sure, you may have to turn a dial to select your stitch, but you won’t have to worry about the touchscreen suddenly failing (which would make the stitch selection useless anyway). With the 7318, you simply turn a dial to choose your stitch, and start sewing. Stitches are listed by letter (A, B, C, etc. ), and all of the letters and corresponding stitches are listed on the front of the machine. There are 18 to choose from – both decorative and utility. Decorative stitches are listed in a pink color, while the utility stitches are listed in blue. There’s also a four-step buttonhole, which I found to be very easy to use. The decorative stitches are fun and add some flair to your projects. One stitch looks like leaves, and another like lattice. Of course, the machine also comes with the basic stitches that you’ll use for most projects. The 7318 really is so simple and easy enough for even a novice sewer to use. Stitch length and width are also selected with a dial. This particular model offers a max stitch width of 5mm and length of 4mm. To lock stitches, simply use the reverse lever located right below the stitch length dial. Is the Janome 7318 Easy to Use? If you’re looking for an affordable, easy-to-use and basic sewing machine, the Janome 7318 is an excellent choice. I grew up using a similar sewing machine. No, it doesn’t have an automatic threader or bobbin winder, but the lack of these features doesn’t take away from the machine’s performance. In fact, I would dare to say it makes the machine even easier to use. The 7318 features a 5-piece feed dog, and snap on presser feet. The bobbin winder is push-pull, and the full rotary hook bobbin is top loading. Threading and winding the tread is simple enough, and if you’ve never used a sewing machine before, you’ll find that Janome provides detailed, thorough instructions on how to get started. If you’re sewing pant legs or sleeves, the free arm is convenient feature. Just remove it by sliding it to the left, so you can quickly and easily tackle those smaller, narrow projects. Fashion darning and free motion quilting is also simple and easy with this model thanks to its drop-feed system. I was pleasantly surprised by the number of accessories that came with the sewing machine. Janome gives you everything you need to start your very first sewing project right out of the box (aside from the fabric and thread of course). Whether you’re sewing a garment, making a quilt or making pillows for your home, the Janome 7318 comes with everything you need to tackle all of your sewing projects. The only accessory this machine is missing is a carrying case. But those are affordable enough to purchase separately. And let’s face it – the carrying cases that come with most models are generally not of the best quality. You’re almost always better off buying one separately. There’s a lot to love about this machine, but it’s not completely perfect (what machine is?). Let’s take a look at the good and the not-so-good things about the 7318. If you’re used to high-end computerized sewing machines, you may find the 7318 to be a bit noisy. It’s not loud enough to wake the neighbors, but it’s still something you should be aware of. For me, this was absolutely not a deal breaker, and the noise was really only noticeable when I was sewing at higher speeds. The Janome Magnolia 7318, in my opinion, is on of the best simple sewing machines you can buy. It’s affordable, so easy to use, and it sews like a dream. If you don’t care about all the extra bells and whistles that come along with expensive computerized sewing machines, this is the machine for you.